As it marks the seventh anniversary of the anti-Gadhafi uprisings, Libya has no shortage of areas prone to a spike in violence. Yet, the greater Tripoli area stands out. Forty percent of the country’s 6.5 million citizens live in the capital. Every tile of the country’s human mosaic is represented in Tripoli’s eclectic makeup. Home to the internationally recognized Government of National Accord (GNA), it is the location of a deep-water port, a naval base and two airports (though only one is functional at this time, while the seaport is almost inactive). Tripoli also houses the country’s central bank and the National Oil Company’s headquarters. Strategically, symbolically, institutionally and economically, a foothold in the capital is indispensable to every major actor with ambitions in the country. 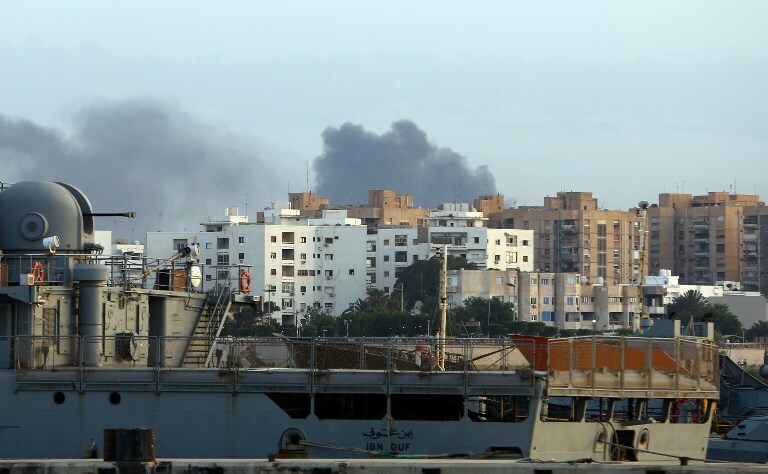 Devastating clashes last month in Tripoli’s Mitiga airport between armed groups ostensibly aligned to the GNA were a reminder that the Libyan capital is still not insulated from the country’s anarchy. While militias in the area are now showing signs of preparation for the inevitable follow-up to the January 15 incident, narratives and perceptions are competing, too. This in turn will trigger wider ramifications for the civil war. Based 1,000 kilometers to the east, the self-declared Libyan National Army is led by Khalifa Haftar. Lieutenants of the anti-Islamist commander said recently that they were preparing to “march on Tripoli” with a view to “ending the crisis.” But with fewer than 25,000 troops, the LNA is neither mobile, cohesive nor powerful enough to embark upon such an open-ended undertaking. Furthermore, Haftar’s foreign backers, led by the UAE and Egypt, have in recent months shown less immediate appetite for this kind of adventure. Meanwhile, other countries have a deep interest in helping ensure Tripolitania, Libya’s northwestern quadrant, does not become a theater of protracted urban warfare. The violence still plaguing Benghazi, months after the LNA proclaimed victory there, only amplifies those misgivings. Italy, Algeria and other players have expended considerable diplomatic effort lately to make their skepticism about Haftar’s methods known in Washington, Cairo, Moscow and other capitals. Rather than being swept from outside by the LNA’s supposed “march,” the Tripoli area is more likely to see the continuation of a dynamic already on display in the capital’s wider vicinity. Since late summer, four battles have taken place there: Sabratha (70 kilometers west of Tripoli) in September-October; Warshefana (near the southwestern part of the capital) in November; Abu Kammash (by the Tunisian border near Zuwara) in early January; and Mitiga airport (east of Tripoli) in mid-January. All of them involved local Tripolitania-based outfits claiming to be “anti-crime” forces affiliated with the GNA. These groups, which already control most of Tripoli, boast a narrative line distinct from that of Haftar, who opposed none of the four battles. Understanding this helps in discerning what may be in store for northwestern Libya this year. By the second half of 2015, conflict had exhausted many ordinary Libyans. Large swaths of the country had become overwhelmed by networks smuggling goods and humans; rampant corruption; kidnappings; and a complacency toward, or active complicity with, jihadi groups. In the public’s fatigue, some armed-group leaders saw an opportunity to gain legitimacy and alter the balance of power in their favor. Although partly animated by a genuine desire to fight crime, the movement has been, at its core, a manifestation of little more than cynical opportunism. Almost all armed groups in Libya violate human rights, oppose the rule of law and engage in crime themselves – albeit not with equal brazenness. The first militia leader to take on the “anti-crime” narrative was eastern Tripoli’s Abdelraouf Kara, a former welder born in 1980. He claimed in various interviews that he took up arms in 2011 against Gaddafi’s forces. After that war ended, the Saudi-aligned Salafist focused on providing local security, confiscating alcohol, breaking drug-trafficking networks, cracking down on homosexuality and running an extrajudicial prison. Then, in the summer of 2014, clashes rendered Tripoli’s main airport inoperable. Mitiga, where his Special Deterrence Force has been based, became the capital’s only functioning airport, thus boosting Kara’s clout even further. In late 2015, the man who had declared himself an enemy of the Muslim Brotherhood, announced he would add the fight against ISIS to his agenda. Yet, he committed only a handful of his men to the 2016 internationally-backed effort by mainly-Misratan groups to uproot ISIS from Sirte. Instead, Kara doubled down on his “anti-crime” stance. Some Tripoli-area groups, including the eastern-suburb militias that attacked Mitiga last month, fought ISIS in 2016. But many other militias, Salafi and secular alike, made a calculation similar to Kara’s. The position they took – toleration of the UN-backed GNA; aloof agnosticism about Haftar; harsh opposition to political Islam; and rhetorical insistence on combating crime – proved a winner. It turned out that Tripoli residents were indeed more concerned with local gangsterism than with ISIS in Sirte, 400 kilometers away. On the international level, Egypt, the UAE and some other states active militarily in Libya, did not assist the anti-ISIS campaign in Sirte, either – showing that politics trumped counterterrorism. Tripoli’s so-called “anti-crime” militias form a powerful condominium when they coordinate against a common enemy, as was illustrated last year when they expelled several key Islamist and Misrati hard-line figures from the capital. Today, the anti-crime stance continues to be attractive to pragmatists, since it enables those previously associated with Islamists to distance themselves from the latter without having to pledge allegiance to Marshal Haftar, a polarizing strongman still unsure of his nationwide popularity. The latest leader to jump on the bandwagon is Usama Al-Juwaili, the head of Zintan’s military council. The 57-year-old commander, who is aligned with the GNA and based 160 kilometers southwest of Tripoli, carried out the advance on Warshefana and the attempt to take control of a key border crossing with Tunisia. In both cases, Al-Juwaili emphasized the necessity to combat crime in those areas. As his men approached Tripoli in November, Haythem Al-Tajuri, an anti-crime figure at the helm of one of Tripoli’s most powerful groups, accommodated from his end. A similar approach could be attempted to close in on Tajura, just east of Tripoli. The militias there have links with Islamists, Misrata hard-liners and other elements engaged in the fight against Haftar. If the move succeeds, it will likely be repeated until all Islamist and hard-liner holdouts in the greater Tripoli area end up being isolated or rooted out. A question may then arise in foreign capitals: If “anti-crime” does the trick in Tripolitania, who needs Haftar there? Jalel Harchaoui teaches geopolitics at the Université de Versailles and Université Paris-Est. He also teaches political risk at EDC Paris Business School. He is a PhD candidate in geopolitics at Université de Paris 8. His dissertation focuses on the international dimension of the Libyan conflict.